Groundwater contamination is a common environmental problem in Australia, and is usually the result of poor environmental management, especially in high density industrial areas. Groundwater contamination occurs for a variety of reasons including poor storage or disposal of industrial waste, and the mixing of rain and industrial chemicals, and can present serious risks to the environment and human health. In this blog we take a look at why groundwater is such an important natural resource, the different types of pollutants, properties that may be at risk and how to manage groundwater contamination. Groundwater is an incredibly important natural resource in Australia; it is used as a main source of drinking water for many cities and towns and serves a wide range of other purposes in irrigation, agriculture and industry. Groundwater use has increased steadily over recent years as surface water resources decline due to climate change and prolonged droughts, for example, in Western Australia groundwater supplies about two thirds of the state’s water requirements. Australia’s total water consumption is estimated to be around 15,000 GL per annum, and groundwater is estimated to make up one third (roughly 5,000 GL) of this. Of course, groundwater is also integral to natural ecosystems, acting as the sole water source for much of Australia’s native fauna and flora, and contributes to rivers and lakes in times of drought. Because of our heavy reliance on this natural resource, groundwater contamination has the potential to be extremely destructive. There are many different types of pollutants that can be involved in groundwater contamination, including organic and inorganic chemicals, bacteria, radioactive materials and physical barriers. Pollutants found in surface water are also commonly present in groundwater, however these pollutants will have a different impact on each type of water source. Groundwater can become polluted either through point-source contamination (coming from a single tank, disposal site or facility) and nonpoint-source pollution (from chemicals spread out across a wide area like pesticides or runoff). Waterborne diseases can spread via groundwater, often through faecal (human or animal) contamination (usually from farming or pit latrines). Common pathogens in faeces are bacteria, viruses, protozoa, and helminths (parasitic worms like tapeworm). Pathogen contaminated groundwater poses significant health risks and is unsafe to drink; if it is ingested it can lead to diseases like cholera and diarrhoea, which can be fatal if left untreated. Nitrate is another potential pollutant, caused by pit latrines and excessive fertiliser use (often manure. This pollutant can pose environmental and human health problems, including a phenomenon called “blue baby syndrome” (caused by methemoglobinemia) where the oxygen carrying capacity of haemoglobin is decreased and can lead to death. Arsenic is a chemical found naturally in certain rocks, and is highly toxic in its inorganic (carbon compound) form. Areas with particularly high arsenic concentration are at risk of groundwater contamination, especially if arsenic containing rocks have been exposed to the groundwater through processes like mining. Arsenic contaminated groundwater, if left untreated, can result in human and animal poisoning, and long term exposure can result in cancer and skin lesions. Arsenic ingestion is also associated with developmental conditions, cardiovascular disease, neurotoxicity and diabetes. Groundwater can also become contaminated with naturally occurring fluoride – a chemical sometimes added to drinking water to prevent tooth and bone decay. Although fluoride is beneficial in small doses, excessive consumption can damage bone tissue. Radon gas is produced as a result of the breakdown of naturally occurring uranium in soil, and can make its way into groundwater. Although radon is most dangerous when inhaled (it has been found to contribute to lung cancer), it still poses health risks when consumed in water and radon contaminated groundwater must be treated. There are many chemicals used in industry, and households, that contribute to groundwater pollution. Remnants of substances such as road salts, solvents, pesticides, herbicides and insecticides, and cleaning products are often washed away by natural rainfall, and eventually seeping into the soil and infiltrating the groundwater. 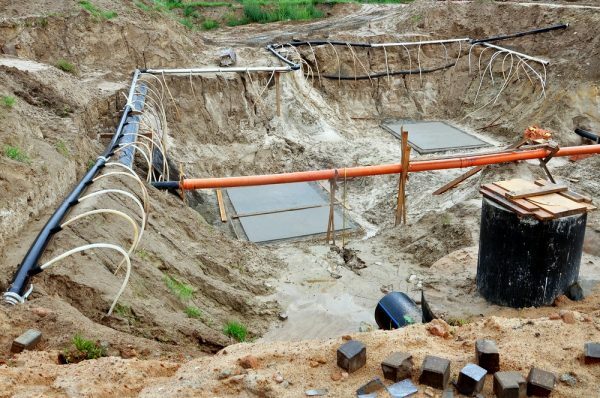 Other man made/industrial forms of groundwater contamination come from the incorrect storage or disposal of hazardous wastes and chemicals (including leaking underground tanks and pipes, chemical spills and the flooding of landfill). Groundwater can also become contaminated via indirect atmospheric pollutants. Pollutants in surface water can enter the atmosphere through evaporation, which can result in acid rain. Through this process, pollutants (including petroleum emissions) make their way into the soil and groundwater, posing serious health risks. The best way to tackle groundwater contamination is prevention through the proper use, storage and disposal of chemical substances and waste products, however this doesn’t take into account the many naturally occurring pollutants in groundwater. To combat this (as well as man-made errors), robust water treatment and filtration processes must be put in place. If, however, you are concerned that groundwater contamination has already occurred, there are various ways to test for evidence of contamination and come up with groundwater quality management plans. Alpha Environmental offer a range of groundwater testing and management services including Environmental Site Assessment and Detailed Site Investigation, Development of Detailed Hydrogeological Conceptual Models, Groundwater Contamination Assessment for Statutory Environmental Audit, Groundwater Monitoring Well Installation and Commissioning, Long Term Groundwater Monitoring Program Implementation and Management, Remediation Options and Implementation, and Groundwater Quality Management Plans. If you have any concerns regarding the groundwater on your site, enquire with us today about a groundwater assessment in Melbourne on 1300 039 181.